Many factors have conspired to increase market volatility and push stocks lower over the last several weeks. Chief among them have been nervousness over the timing of Federal Reserve (Fed) interest rate increases, worries over the outlook for the Chinese and eurozone economies, the escalating Ebola epidemic in Africa, and rising geopolitical instability—particularly in the Middle East. Others add the collapse in oil prices or commodities in general, global warming or just plain irrational fear. Technical analysts will cite the S&P 500 falling below the 200 day moving average or another favorite indicator, but that doesn’t explain why it fell through the glass barrier. Most of these are merely examples of the post hoc fallacy in which people notice that one event followed another and concluded that the earlier event must be the cause of the later one. An obvious example is attributing the rising of the sun to the crowing of a rooster. As of this morning's reports, we have now Q3 results from 65 S&P 500 members that combined account for 18.8% of the index's total market capitalization. Total earnings for these 65 companies are up +2.1% from the period last year, with 63.1% beating earnings estimates. Total revenues for these companies are up a much stronger +5.3%, with 55.4% beating top-line estimates. …the market isn't reflecting developments on the earnings front. Not that earnings are great, they are not - and they haven't been great for almost two years now. That said, earnings aren't terrible either. On most conventional comparative metrics, the Q3 earnings season is tracking closely what we had seen in the preceding reporting cycle. The confusion over the cause of the market’s decline gives me the opportunity to shine the spotlight on an important point of methodology that separates good economics, that is, Austrian, from the rest of the crowd: theory is necessary for interpreting history. The mainstream approach to finance and economics is to try to distill theory from the corn mash of data. But the truth is that historical data are so vast, complex and contradictory that they can support any crackpot theory if the analysts looks hard enough. Distilling theory from historical data is an example of scientism, the application of methods from the natural sciences to the social sciences. Because the subjects of the two sciences are so different, different methods are required for analyzing data. Yesterday’s data is still history and the only way to make sense of it is by filtering it through sound theory. Hayek wrote in Profits, Interest and Investment that business people watch profits, not interest rates, as guides to investing. One of the main points of the book was that the business cycle will happen because of changes in profits regardless of whetheer banks keep interest rates artificially low and even if CPI inflation slumbers. Profits shift when consumer spending picks up. Mainstream economists view high profits in consumer goods sectors as a good omen for the economy. But according to Hayek they are the warning sign of the upper turning point in the economy. Leadership in the stock market seems to understand that even if they don’t know about the ABCT. Most explanations of the market drop have focused too much on the past. Those analysts use a form of mental linear forecasting: the future will be like the past. But the professional investors at major institutions are not focused on past data. They try to peer into the future. Something about the future indicates to those selling stocks that future profits will not be good. They probably saw my post from September 30. I wish I had enough readers to move the market. 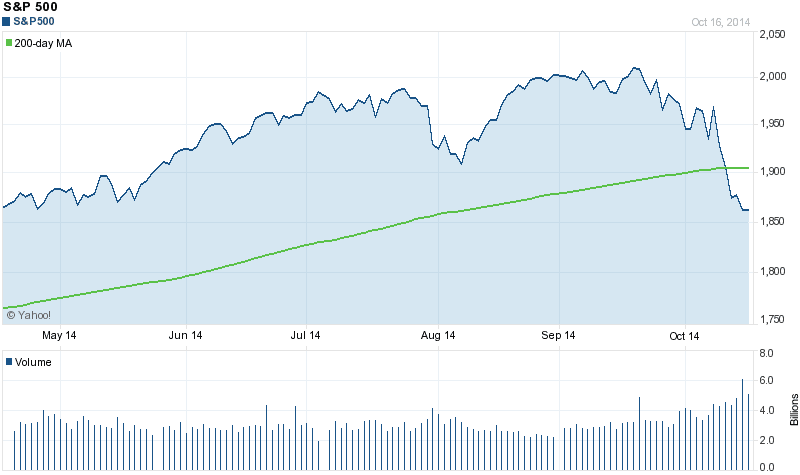 But the chart showed the S&P 500 quarterly average had soared above the level justified by recent profit data. I’m sure many analysts besides me noticed the divergence, too. The obvious conclusion is that either profits must increase dramatically or the market must fall to a level justified by profits. A third possibility would be that investor risk tolerance increased, but that would reduce yields on the stock market and make bonds more attractive than stocks. The stock market and the money supply are the two main leading indicators in most models that try to forecast recessions. This decline could be just a correction, but it could also be an indicator of a recession looming in about six months. As the great Austrian economist Ludwig Lachmann wrote, the stock market is essentially a futures market anticipating future profits, not past ones. More investors see bad news ahead for profits than see good news.